Are you considering to add themes support? In fact, just hardcoded dark/bright will be enough. No, HeidiSQL won't get its own theming. Instead, the colors of your Windows settings are used, so there is no need for another redundant theming. The SQL keywords can get customized colors, in Tools > Preferences > SQL. There is no such setting in Windows 10. You can choose colors for "metro" app windows, but not for classical ones. Dumb, but it is what it is. Bear in mind that HeidiSQL is most likely a native app, whereas themeable apps are mostly webtech-based apps, or applications with a diabolical amount of development capacity behind them. In a native app, it's surpisingly difficult to apply custom theming. ORLY? We've managed to write themeable apps in nineties with Delphi, C-builder, and VC - but now it's "surpisingly difficult"? C'mon. It's just color schemes, we don't need application to became a tropical parrot. Theming is more than just a few colours. It also involved being able to install themes and enabling users to create their own. All that is dead-easy in webtech-based applications, but a lot more involved in native applications. I think that hardcoded dark/bright is 1000% better than no themes at all. There should be DARK THEME / BRIGHT THEME even if it will be hardcoded. Where is the Like button for comments?! ???? It's not THAT hard in native apps either. We really don't need some dedicated theme store and have 1000 different themes, but in 2018 there should be at least a basic support for a light/dark UI. Many people have problems with eyes and it really helps to have the option. I totally agree with the author. Where is dark UI? really, it's a necessity for anyone who already uses this type and theme in other applications. I agree with the author. I just spent ten minutes writing out a very detailed post with the exact working answer (and more) though the forums won't allow me to post links because my post count is insufficient according to the forum settings. If someone would contact ansgar on my behalf (I don't have time) and then if he could reply either directly to me or to this thread I will post what I saved (always save your long post content). For the greener out there, please don't post pointless replies and stretch out this thread any further. ansgar, could you please adjust either my account or the forum settings? I don't want to pointlessly post on other threads or "spam up" a new thread. Yes, it's a bit of a pita. Yes, you're going to have to run another process. No, I haven't taken over the tech industry and fixed everything...yet. Read the directions to fix static Windows Explorer panes so they aren't light/white too. You want want to go in to Control Panel → Personalize → Window Color → Advanced Appearance Settings and change the font as it makes ambiguous difference at best between upper and lower case. Ensure you have installed UxStyle and that the process "UnsignedThemesSvc.exe" is running. You should not set the background-color as pure black (#000 / #000000) as there is text that is hard-coded to be black in some programs. It was very frustrating though well worth it. If you get the theme working though your Classic Shell start menu renders via software (e.g. slowly) then the UXStyle process is probably not running. To fix websites in general you'll need the Stylish extension for Waterfox; the only browser left on the planet that can truly be customized. Keep in mind that some websites do not style certain elements (commonly form fields) so they may inherit the dark color theme; you could override this with Stylish however though it's difficult in such cases because it's either per-website or always-on/off-until-you-toggle-it which makes it annoying when you're researching a topic on unfamiliar websites that you don't frequent. I also wrote a tutorial for cleaning up the graphic user interface Windows 7 (should work fine for 10 as well) as well and attached the black start button image to this post. It sometimes takes a lot of time though eventually I conquer problems and I try to make sure it's reasonably easy to reproduce the steps to solve problems so other people can skip the hassle and get straight to being productive. I hope this helps out though in the end, yes, HeidiSQL should natively support themes because it's such a PITA to get things working natively. At least HeidiSQL does support some color customization which generally works well with this solution. 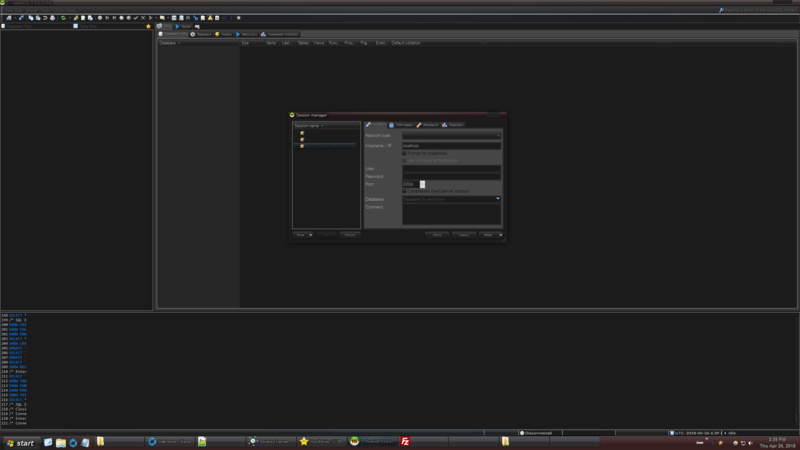 I prefer the dark color themes for two reasons. First it's more aesthetic though secondly it's also for health reasons: too much blue light can negatively effect a person's circadian rhythm and lead to insomnia. There is a program that allows you to both automatically and manually adjust blue light: F.lux. Supposed (maybe) historical fun (maybe) fact: apparently humans evolved the ability to actual see the blue part of the light spectrum only a few hundred years ago. Additionally while the vast majority of users should be technical enough to view the image (right-click, view image) to view it in full glory here is a convenient link to the image I posted. I have a 32" 4K screen though I imagine I'd have to have at least a 42" screen to feel comfortable at 3840x2160 so I stick to 2560x1440. Ansgar, is there a way I can export the code for the styles I did change? I can not remember which styles I changed and I saw nothing in AppData\Roaming\HeidiSQL or AppData\Roaming\HeidiSQL. Maybe those settings are stored in the registry? The query editor colors should all have a name starting with "SQL Attr". But there may be others you changed as well. You can export all settings to a textfile, which can be imported again. But this is not meant and it does not work for partially settings, e.g. with colors only. You can only export all settings, including sessions and whatever we have there. 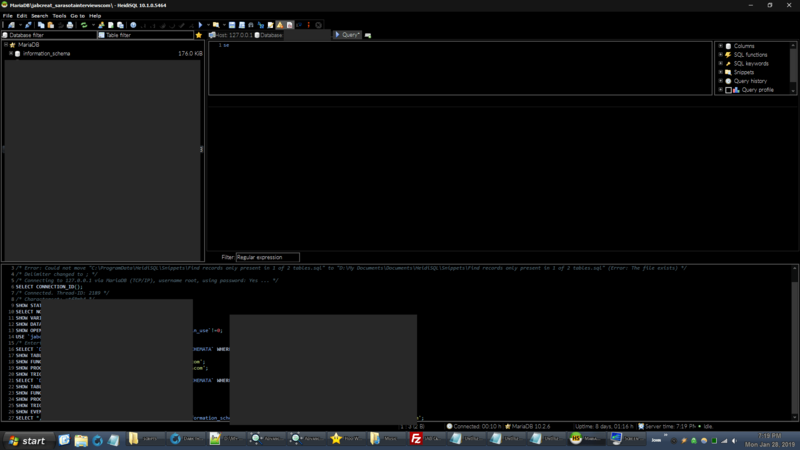 For those coming late to the discussion I'm using "Windows 10 Dark" theme (on Windows 7 x64) on HeidiSQL 10.1.0.5464. It's as dark as a theme is going to get and has good contrasting (text) colors. My tutorial above is still valid for most Windows GUI / applications though I highly prefer per-application theme support. Thank you Ansgar!